I’ve spent several years harvesting milkweed seeds for my butterfly garden, but I’ve come to realize that the rocky, thin soil on the mountain just doesn’t seem conducive for their growth. Having Monarchs around my yard would be great, but so far I’ve only attracted the swallowtails by planting parsley in the garden. This year, though, The Hill School had a huge crop of milkweed plants, so I couldn’t resist picking some pods on my walk today for spring planting. Even though I haven’t had much luck, I’ll keep trying since my small garden just doesn’t seem complete without those gorgeous orange-and-black butterflies stopping by for a summer break. During WWII, school children were encouraged to collect milkweed as the fibers were used instead of kapok for life preservers. I wasn’t certain I really remembered that correctly but that is accurate and I was shocked to learn the number and variety of plants that are considered milkweed. Yes, I know, I am supposed to comment on the artistry of you photography but I always get carried away with your subject matter! I seems your beautiful photographs always evoke hidden memories. Thanks, Lucinda. I love your stories and the history you provide. Please keep your comments and remembrances coming! 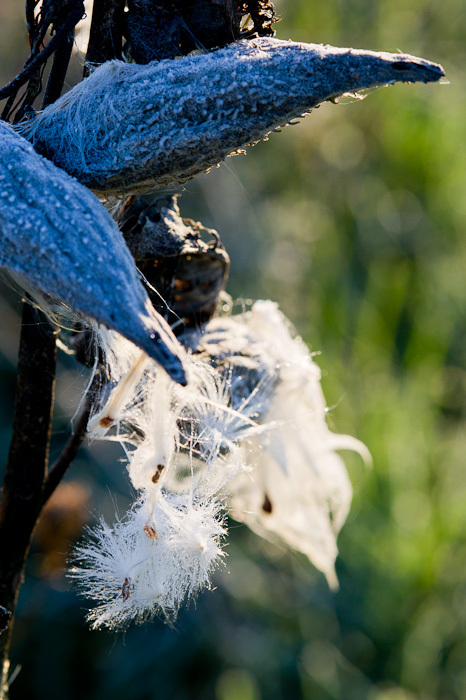 Milkweed pods make for good photo shoots–nice photo with lots of close details. I had monarchs as late as the first week of November. Oh, how I wish we had monarchs up here. I miss them. They are my favorite butterfly. I think it’s partly because I admire their fortitude and the fact that their migration is so impressive. Thanks!